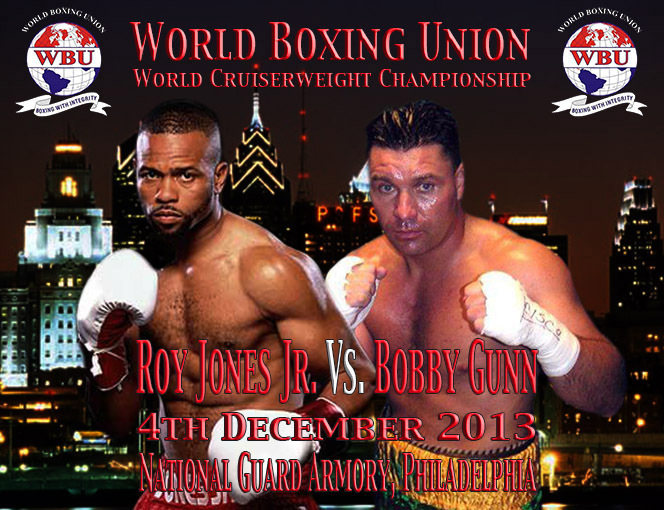 World Boxing Union President Don ‘Moose’ Lewis today officially announced that Roy Jones Jr. will face Bobby Gunn, at the National Guard Armory in North Philadelphia, PA on Wednesday 4th December 2013 for the WBU World Cruiserweight title. During his twenty four year professional career Jones Jr. has secured world titles in four different weight catagories – Middleweight, Super Middleweight, Light Heavyweight and Heavyweight – and is the only boxer in history to start his career as a Light Middleweight and then go on to win a Heavyweight Championship. On winning the WBA Heavyweight title, by beating John Ruiz by unanimous decision on the 1st March 2003, Jones Jr. made history by becoming the first former middleweight champion to win a heavyweight title in 106 years. However, whilst he has been one of the most successful sportsman of his age, Jones Jr. makes no secret that before retiring he wanted to add the ‘missing’ Cruiserweight crown to his already overflowing trophy cabinet. However it has not been an easy road for Jones Jr. to travel in his bid for the elusive Cruiserweight Crown he desires. Back in 2009 Jones Jr. made an unsuccessful bid, against Australia’s Danny Green, for the International Boxing Organisation’s version. After the unsuccessful title bid, Jones Jr. then went the distance with old foe Bernard Hopkins, who made amends for his loss of the IBF Middleweight Crown to Jones Jr. some ten years earlier, followed one year later by the last round KO loss to Denis Lebedev. On December 4th Jones Jr’s opponent will be the former IBA Cruiserweight World Champion and the current Bareknuckle Heavyweight Champion, Canada’s Bobby ‘The Celtic Warrior’ Gunn. Like Jones Jr. Gunn has a fearsome record - 21 wins (18 KO) 5 losses (4 KO) and a single draw – although it must be said that is still less than half of bouts fought and won by Jones Jr.
Gunn may have lost both his previous Championship challenges, against IBF Cruiserweight Champion Tomasz Adamek in 2009 and in 2012 against James Toney for the vacant IBU Heavyweight title, but is no easy opponent for Jones Jr. Prior to those losses, he won three Championship bouts in a row, all by stoppage. In July 2008 Gunn stooped James Morrow in the fifth to secure the IBC Inter-Continental Cruiserweight title. Later that year Gunn successfully defended the IBC title and secured the vacant WBC United States (USNBC) Cruiserweight title, with a third round stoppage of Shelby Gross. Three months later Gunn successfully defended the WBC United States title, as well as secured the vacant NABA Cruiserweight title, with a fourth round stoppage of Brad Gregory. World Boxing Union President Don ‘Moose’ Lewis said of the upcoming Championship fight. “What a way to end the year. Roy Jones Jr. is a living legend and we are honored to have him fighting for our Cruiserweight title. During his exemplary career Roy has done it all, I can’t think of how many titles he has won, but it has to be around but it’s definitely in double figures, I wouldn’t even guess at how many Championship fights he’s had defending those titles either. Bobby Gunn has also won quite a few titles in his career, so knows his way around a Championship fight.